​A feeding tube can also be helpful if you are spending 45 minutes or more trying to eat each meal. By spending so much energy eating, you may actually end up burning more calories than you consume, and thus lose weight. Most, but not all, ALS patients decide to get a feeding tube. You can always get a feeding tube and then either not use it or have it removed. The surgical procedure takes about 30 minutes and the tube itself requires minimal care. Before getting a feeding tube, be sure to talk with your ALS Clinic team’s nutritionist to make sure that you are already following best practices for staying hydrated and receiving proper nutrition. Excessive saliva is one of the biggest complaints from people who are having difficulty swallowing. If you begin having problems swallowing, you may also notice that saliva builds up in your mouth. In addition to being annoying and inconvenient, excessive saliva can be dangerous. It can cause choking, especially at meal times. Talk with the speech language pathologist on your ALS Clinic team about ways to address this problem. If you continue to struggle with excess saliva, it may be time to consider getting a feeding tube. When should I get a feeding tube? If you are choking, having trouble swallowing food or medication, losing weight, struggling to stay hydrated, or aspirating (when foods, liquids, or saliva go into the lungs), you may want to discuss a feeding tube with your ALS Clinic team. Your team will discuss how to prevent aspiration, which can cause infection and pneumonia. If you choose to get a feeding tube, sooner is better than later. Once your forced vital capacity (ability to forcibly exhale) is below 50%, you become more at risk during surgery and your recovery time can be longer. For a person with over 50% forced vital capacity (FVC), getting a feeding tube is a simple procedure. It takes about 30 minutes under mild sedation, and then you can go home. If you are below 50% FVC, surgery is riskier and you may be asked to remain in the hospital for a day or two. 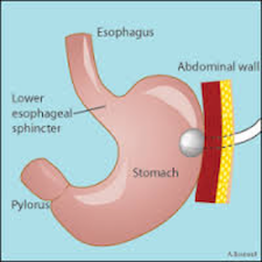 The type of feeding tube that ALS patients get is called a PEG, which is inserted directly into the stomach. Once you have a feeding tube, you can still eat and drink orally (as long as you can swallow safely). You also have the option of pouring liquids, liquified food and formula, and medication through the tube. Many ALS patients get a feeding tube early and gradually use it until it becomes their only option for receiving food, liquid, and medication. The ALS Association website provides further details about feeding tubes. Be sure to create or update your wishes for medical treatment in the event that you are unable to communicate them in person at the time.